The HEARTest Yard | Half Heart. Whole Life. 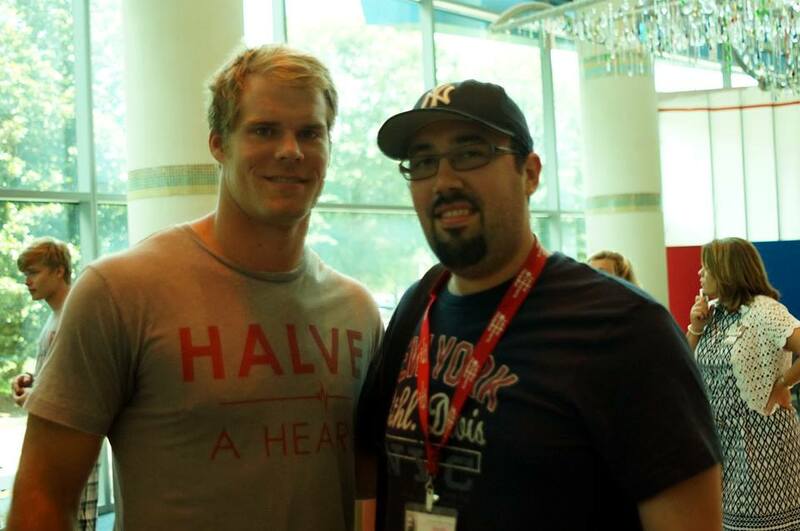 Early on in this blog you recall that I wrote a post about Greg Olsen from the Carolina Panthers, who also welcomed twins a couple months before we did. One of his twins, like Nolan, had Hypoplastic Left Heart System. Greg has been an incredible spokesperson and advocate for CHDs and HLHS, and it was really cool to have him right here in our city. 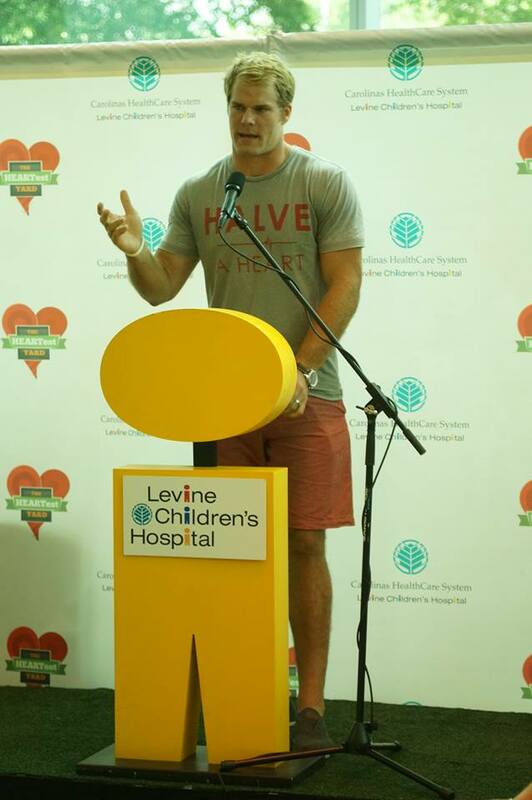 While we were in Progressive Care with Nolan post-cath, I saw on twitter that Greg would be doing a presentation there at Levine Children’s Hospital. I tweeted Greg and asked if anyone could come and he said yes. So while Bekah was working on discharge with Nolan, I went down to the lobby to check out the ceremony. Most of the cardiac team was there, including a lot of Nolan’s doctors and his surgeons and nurses. The media was there too and some other heart families. I just hovered around the back trying not to get in anyone’s way…plus I just spent the night at the hospital so I looked like a complete wreck and I didn’t want anyone to think I was just some crazy person who stumbled into the lobby. I did get to meet someone named Casey who was a heart mom and her son Murphy, who also has HLHS. It occurred to me that Murphy was the first HLHS kid I had actually met. And he looked GREAT! Completely healthy and cute. I got to chat with Casey for a little bit about Nolan and how things have been going so far. I also got to see Nolan’s surgeon, Dr. Peeler. I was actually really excited to see him and I said, “Hey Dr. Peeler!” He said hello and moved on. Good enough for me. Then the ceremony started. He talked about his experience with HLHS and particularly how the “interstage,” which is the period of time between the 1st and 2nd surgeries, is very critical. 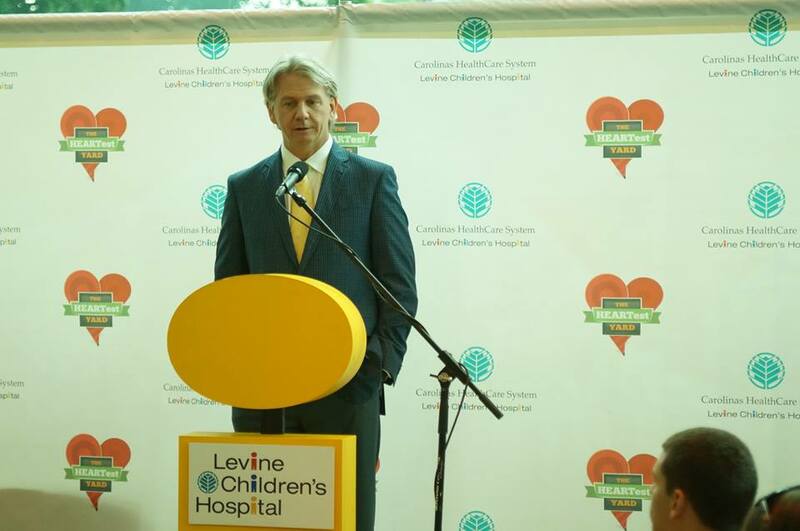 He said that the staff at LCH managed to get HLHS kids to survive via the first surgery…now he wants to ensure that HLHS babies THRIVE after their first surgery. I was fascinated. This was good stuff. He talked about how Greg Olsen’s efforts have allowed them to develop a program called The HEARTest Yard, which will help parents financially with in-home nursing care, physical therapy, speech therapy, etc., during this interstage period. You know, I was SO thankful to have Dr. Peeler as Nolan’s surgeon…I knew he came with a lot of credentials and recommendations, but it wasn’t til this moment that I realized that not only did he know what he was doing, but Dr. Peeler REALLY cared about the kids he treats…he doesn’t just want them to survive, but to thrive…and he realizes it’s a team effort. Greg Olsen came up and spoke about all the fundraising they did to help develop The HEARTest Yard (over $230k!!!). He talked about how he had dinner with Dr. Peeler and said “You’re the expert…so how can I help?” and Dr. Peeler laid out all his ideas about helping kids through the interstage process. Greg proved to be very well-versed in the heart program and HLHS and I was really happy to have an ambassador like him in our corner. After the ceremony was over and the big ol check was presented, I actually got an opportunity to meet Greg’s wife Kara. I told her that we also had an HLHS baby that was a twin and she seemed genuinely excited to hear that since it’s not a common thing. She was very nice and took quite a bit of time to chat with me. Finally I got a chance to meet Greg and talk with him for a few minutes. I told him about Nolan (he even said he remembered my tweet…yeahhh boy) and thanked him so much for everything he did. He’s a nice guy…and big as a house. During all this, Nolan was discharged and he came downstairs with Bekah, who also got to meet Kara Olsen. It was really nice that I got a chance to be a part of this. It’s funny, Nolan’s cath was postponed twice and it kinda got annoying, but this time it worked out nicely. It was good to meet other heart parents and feel the love! Posted on January 20, 2014, in awareness and tagged CHD, congenital heart defect, Dr. Peeler, Greg Olsen, HEARTest Yard, HLHS, hypoplastic left heart syndrome, LCH, Levine Children's Hospital. Bookmark the permalink. Leave a comment.